So I traded in my skis this morning for a snowboard. I have never been snowboarding before. Wow, is it a different experience. On skis you are moving forward and leaning side to side. On a snowboard you are moving sideways an leaning front to back. The first couple of hours we're pretty rough, but I eventually got it. Man did I fall hard though, and a lot. My rump and shoulder took the brunt of it and I have a splitting headache. 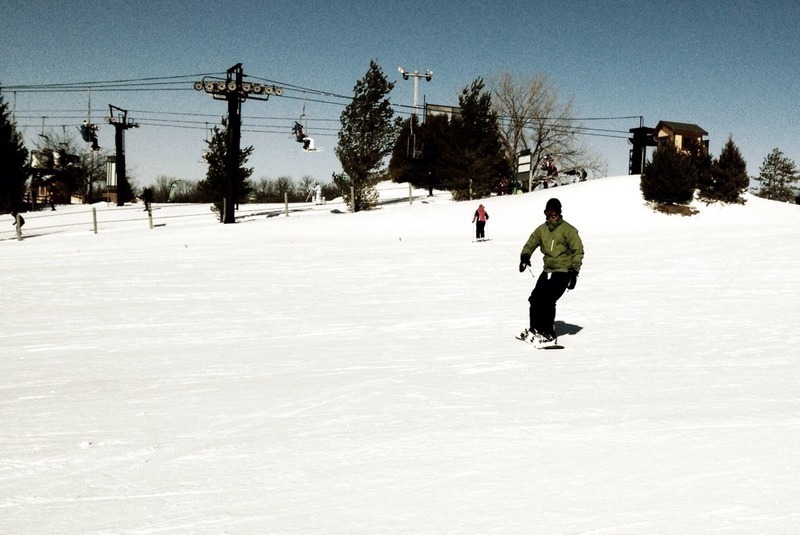 Can't say yet whether I enjoy snowboarding yet since it is tough to compare four hours to my 10+ years of skiing. There seems to be a smaller margin of error though. 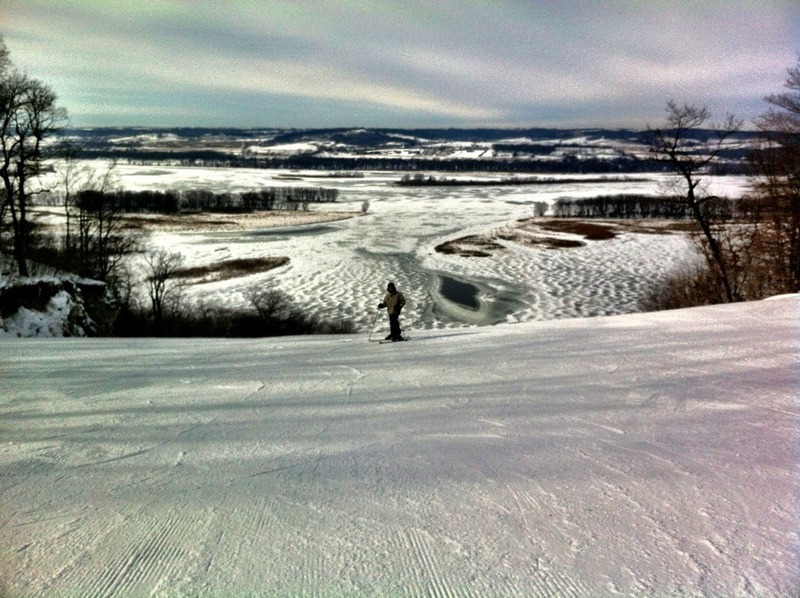 Went skiing in Galena this weekend. Had a blast. It was Megan's first attempt at skiing. She did a good job in the morning, but had a crabby time this afternoon. She had to tell at me not to look at her while we skied. Ultimately my brother and I just went off our own direction and met everyone else later in the day. I rented skis for this trip, but I definitely have a desire to try snowboarding in the future. May even just buy one in the future. 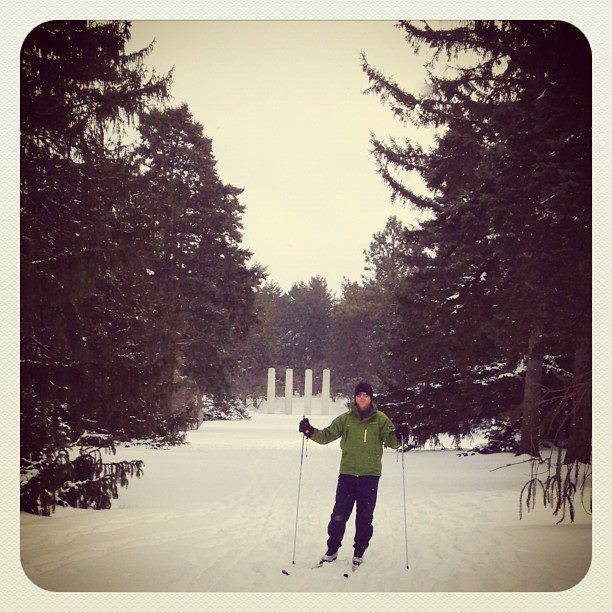 For the past couple of months I have been constantly talking about cross country skiing. Of course our winter went from being forecasted as one of the snowiest in history to the third mildest in history. Chicago finally received some snow this past week and true to form I went out and purchased some cross country skis at REI. They had a pretty nice package deal setup for about $275. I surprised my wife and purchased her a pair as well. Since it was a holiday weekend we had an opportunity to go out twice. The first time we went out to Morton Arboretum where they had a nice groomed trail. This was just two days after the snow too so the overall experience was excellent. Weather was very cold, around eighteen degrees. Megan had never gone skiing before so this experience was all new to her. Overall she did pretty well, but there were some pretty hilarious moments with her falling and attempting to get back up. The funniest of those moments actually came Friday night when she wanted to ski around the backyard to test out her new skis. Our second outing was this morning at a local forest preserve prairie. This was not quite as much fun. The weather was warn, in the low 40's and the trails by this point have had numerous people, dogs and joggers on them. I think the trails would have been nicer had we hit them up a couple of days earlier, but that is just something I will have ti keep in mind for the future. I will have to remember to bring my GPS in the future as well. It didn't even occur to me to track where we skied until the end of the day today.